Author Mariela Dabbah released her latest book, Poder de Mujer, earlier this year. Her new tome is more of a guide on achieving success. In the book you'll find tips from powerhouses like Maria Celeste Arraras and Roselyn Sanchez, and real life examples from many entrepreneurs including yours truly! In a recent interview with Univision's Jorge Ramos, Dabbah shared her expertise. "The first thing that successful women have in common is that they're not afraid," says Dabbah. "They take each challenge without necessarily always being 100% prepared. They take control over their circumstances instead of the circumstances taking control of them." 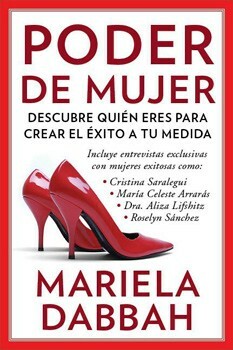 Poder de Mujer is now available on Amazon.com. (Turn to page 84 to read about my personal story and business goals).